Hay’s Galleria is an impressive Grade II listed mixed-use building with desirable warehouse style Grade A office space and exceptional retail and residential opportunities. Offering centrally located space on the riverfront with breathtaking views and much sought after strategically placed retail, leisure and residential space, this beautiful and unique riverside London destination has cultivated an environment rich in heritage, contemporary offerings and community spirit. 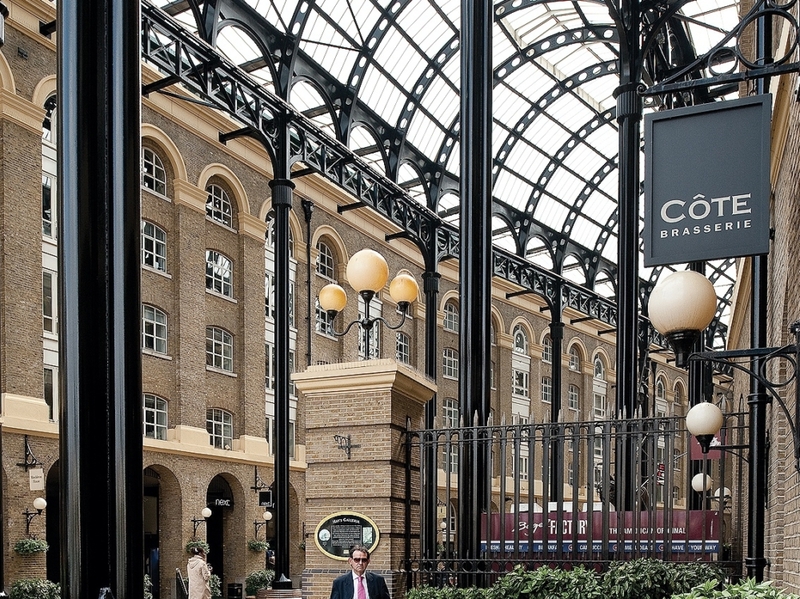 Set within London Bridge City, Hay’s Galleria celebrates its past with great gusto. Originally known as Hay’s Wharf in the 1600s, and then the famous Larder of London in the 1800s, it was at the centre of the trade and shipping port, most famous for its tea imports, until it was damaged during WW2. To mark its rebirth in 1987, a rivet-covered bronze moving sculpture, with the face of a man and the body of an industrial-age ship, named The Navigators, was installed. This unique 60 ft sculpture, created by artist David Kemp, was commissioned to commemorate the shipping heritage that Hay’s Galleria holds so dear. Tastefully redeveloped in the 1980s, Hay’s Galleria was modelled on Milan’s famous and chic Galleria on the Piazza del Duomo. The shopping arcade was elegantly designed with a striking Victorian style glass roof and the docks’ heritage was protected with its original tea and produce warehouses restored to include five interlinking buildings; Goldings, Counting, Shackleton, Tea Auction and Hay's Lane. With 20 retail units, 28 apartments and 300,000 sq ft of office space over five floors, the premises caters for all commercial needs including 24 hours security, bike storage and car parking. Its quintessential British charm, excellent transport links – including the Thames Clippers and London Bridge Station – and superb scenic views of riverside London make Hay's Galleria a popular destination for culture-vulture tourists and local City slickers alike. In amongst this iconic London neighbourhood is a fantastic range of world class food, shopping and entertainment for all tastes and ages.